WHEN it comes to fine, handmade shotguns, the world is your oyster. Traditionally, London guns were considered the best; many of these old and well-known firms continue to rule the bespoke luxury shotgun market. You can buy something used from these wonderful works of the gunsmiths art and get it refitted to suit you. But most of those with long pockets want something unique – and they’re willing to pay for it. That’s why here at Eagle Review, we’ve pulled together a list of some of the world’s finest examples of the shotgun making art for you to salivate over. This exquisite piece is a slim and curvy, sensual firearm. Offered with a single selective trigger, or a double if that’s your preference, is painstakingly built by Holland & Holland craftsman over an incredible 900 hours. It comes in 12, 16 and 20 bores – you pays your money and you takes your choice. Ah, the elegant and ethereal Purdey; a thing of beauty and coveted among sportsman. Based on an original design in 1880 it’s arguably never been bettered and remains the ultimate statue symbol among the cognoscenti. Pulling a pair of Purdey’s from their elegant leather case will not improve your shooting. But it may improve your social standing considerably. Westley Richards is generally regarded as having perfected the art of the boxlock. The workmanship, should you choose to look under the bonnet, is astonishing. There are but seven components in the boxlock mechanism itself, each ingeniously engineered by masterful minds. The single selection trigger, for the geeks among you, has a colossal 26 individually made parts. Purdey makes its second entry on the list with the evergreen over and under version. Old schoolers who harrumph into their walrus moustaches when an O/U is pulled from the slip on game day still exist, especially on the more up-market shoots. But the fact remains that the O/U outsells the S/S every time, and shooters like its simple looks and quick alignment. Difficult to copy and very, very strong, the hinging system creates a low profile and subtle deadly sleekness to this most feline of fine guns. Price in excess of £100,000. The Italian gunmaker is a bastion of workmanship. Dozens of gunsmiths worship here at the altar of Italian sophistication, creating a machine of unrivalled technical excellence. There are countless quirks and house styles brought to bear here; high temperature vacuum steel blacking, a laser-fused sighting rib. So painstaking is its creation, that only around 20 are made each year. Price £150,000 per single gun. Featuring the strongest of all side by side designs due to the integrity of the action bar, the patented round action is cocked by the fall of the barrels. It’s remarkably light and easy to point and swing. Now operating out of Dunkeld, Scotland, John Dickson & Son guns are still a thing to be admired and is much heralded as a quick-pointing grouse gun. Revered as just about the pinnacle of the art, Boss guns are spoken about in hushed tones. The company was responsible for the initial interest in the revolutionary O/U design in England. Light and easy to use, the Boss was also one of the earliest available guns with a single selective trigger. This self-opening double trigger sidelock is a narrow firearm, built entirely from scratch and is offered with some of the world’s finest available walnut to adorn its stock. 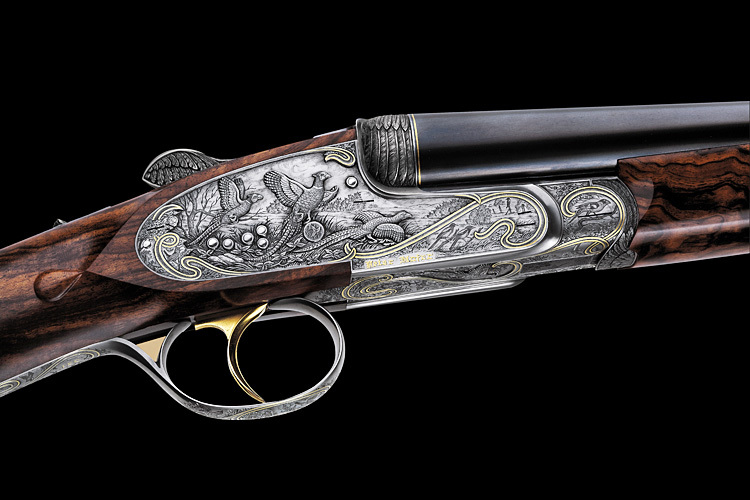 You can snap up a 28 bore, with bespoke deep-scroll engraving, for around £45,000. Never heard of Peter Hofer? Then perhaps you don’t mix in the right circles. The Austrian gunmaker makes some of the most exclusive shooting pieces ever created. Only around six new guns leave the workshop each year. All are utterly original, many take years to come to fruition. Take a deep breath before you phone the bank manager, though. It’s hard to get a complete take on the price of these mighty weapons, but you can expect to pay in excess of £200,000 for something no-one else will ever have. Two models of Greener are offered, each with a wealth of little nods and flourishes which distinguish this gun from the rest. The company takes on special commissions and has a waiting list of around three years. A new Greener will set you back in excess of £130,000.